The rearing of pig project aims the rural development of Bweyeye sectors people. 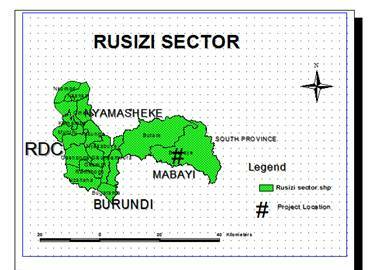 Bweyeye Sector is one among the 18 Sectors which composed Rusizi District of Western province. Bweyeye sector is located near the Forest of Nyungwe National Park at 98km from Kamembe airport toward Rwanda-Burundi border called Bweyeye. On the East by Katabi of Nyamagabe and Kivu of Nyaruguru districts both of Southern Province. Altitude Bweyeye range between 1560m and 2050m. This project is a short term project of about 36 months renewable where by every 12 months of the working there will be project evaluation to check up whether the project has some returns or loss and to make the total budget of the coming year. The source of fund is from money of owned capital which is 705’808 RWF (904,88 euro) in our partial budget and loan of 4'107’578 RWF(= 5266,12 euro aan een koers van 780 RwFr voor 1 euro) from Vleugels van Hoop. This project is called “PIG FARM PROJECT” based on rearing of pigs in advanced manner. It is located in Bweyeye Sector, Rusizi District, and Western Province. The membership of this project decided to keep pigs because of people’s negligence in keeping this type of animal. This negligence led to shortage of pork, fine nutritive manure for soil fertilization and site for scientific research especially on pigs. The plan of activities includes housing for these animals, feeding, caring, curing and selling pig products. The above activities will take 28 months. The coordination of this project is excepting to work with all people surrounding piggery farm project, especially youth. According to climatic factors and geographical location of the region on which this project is going to be carried out, some pigs that like cold altitudes will be favored and others that like hot altitudes will not be favored. The region on which the project is going to be carried out is also a high mountainous whereby some type of pigs that like low land will again not be favored. Therefore while choosing or selecting the type of pigs to be reared, the above factors have to be considered. Unemployment of people around piggery farm project. The above problems existed in western Province since long ago because of tradition beliefs, religion especially Moslems and lack of appropriate knowledge of keeping pigs will be solved by the project. Poverty among membership will be solving by selling of young born piglets, pork and manure whereby money will earned. Some people around the farm will be privileged to have jobs from the piggery. To combat poverty among the membership and pig production at the market within the region and country wide. People surrounding piggery farm project will be motivated to rear pigs and taught how useful and importance they are on them. Therefore they will be encouraged to rear pigs. The coordination of piggery farm will try by all means to find market for pigs products especially hotels, bars, restaurants for pork. People neighbor the piggery farm who are jobless will have an opportunity of being employed by the project. Therefore their standards of living will be improved. According to plan activities, profit is available through efficiency work whereby pork and manure will be sold with different Boucher’s and farmers. Because of different services surrendered to various people the project is totally expecting to reduce poverty while increasing pig production. In addition to knowledge of keeping pigs will be acquired whereby every one who wants to visit the farm will be allowed to visit it. The assembly is composed of all umbrella membership and founder membership. This coordinates all activities carried out within and outside the project. The audit is composed of 3 auditors who are responsible for auditing the budget and the chaise of the project. These are qualified people in finance and accounting. They supervise the entry and exit of the funds; it is composed of 2 men and 1 woman. These are responsible for control any error that may exist in the dynamic of the project. They are 4 including 4 men who are also qualified. The above organization indicates that the project has adequate administrative and technical to carry out the work of rearing pigs. If the project is financially and physically stable the general objectives will be fulfilled; and if the amount of fund required is available a number of membership project will be able to do all activities governing the project. Therefore in terms of finance this project is stable because the sources of funds are visible. It has also young men and women which indicate that the project is physical stable. A female pig produces 2 times a year; it can produce 10 to 15 piglets; it takes 3 months for a female pig to produce. In order to know the interest of the project for 3 years, the following calculation will give the estimation profit for pig production. N.B: Feeding is continuous activities as well as curing. 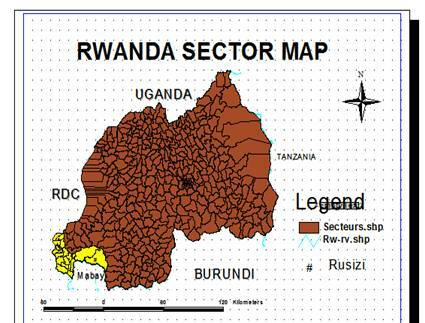 Rusizi sectors where Bweyeye is located are mentioned by yellow color. In the period of 02/07 till 10/09 we have spend the amount of 683 500 FRW. Probably you think we have spend a lot on feeding and medication. This is mainly due to the climate circumstances. It is an unexceptional long dry season and diseases amongst the animals. Therefore we have taken the needed precautions to protect the farm by providing uniforms for our workers and by giving concentrated feeding to our animals, to avoid contamination of the animals by diseases coming from other farms. Conclusion: We can state that our way of working is successful. All sows have been covered. So 23 out of 23 sows will give birth during the months of November, December and January. At that time I'll send you a next evaluation. Evaluate how ‘healthy’ the “Pig project” is. Increase the capacity of the farm, develop new activities, as agriculture, aquaculture, bee hiving and protecting the environment. Efficient steering of the “pig project”. Evaluate the use of the funding by the vzw. Sows and piglets are loosing weight because of insufficient feeding and bed quality of the feeds. This mainly because of the failure of the farmers. The irresponsibility of the veterinarian who is supposed to do follow-up on the farm, causing the failure of the farmers, bad use of the medication on the farm and rivalry amongst the farmer and pig holders who conspire together against the vet. A considerable amount, as shown in the table below, is spend monthly on feeding and security of the farms. Abortion, early birth giving, stillborn piglets because of all kind of faults and the quarantine. We’ll look for an extra employer to assist the 2 others on the farm. Somebody will be employed on trial basis during December and January. The animals will be distributed amongts the members of the cooperative. The pigs will be kept till the beneficiaries have signed the agreements. This has to be finalised in January. 2 or 3 animals will stay on the farm to solve the earlier mentioned problems. The cooperation with the current veterinarian will be stopped. We try to set up a cooperation with a vet from the Bweyeye sector. Agenda point 2 : Increase the capacity of the farm, develop new activities, as agriculture, aquaculture, bee hiving and protecting the environment. In this context we started to plant feeding plants, shrubs (carriandra sp) and passionfruitplants. We also appointed people who are responsible for the project and will garantuee the follow up. They also have to execute the decisions taken during the meetings. The usage of the domain of the farm to solve the problems in feeding, as well as the eventual problems who could pop up base don taken decisions. Here all members could share their opinio non the way we touched on all ideas and how to keep the unity in the cooperative. Also the evolution, the increase in pigs and the use of the products (organic marsh) was talked about. P.S : During the period of quarantine 2 animals (a sow and a boar) died because of negligance of the employers. GATETE Eustache, responsable for the project. 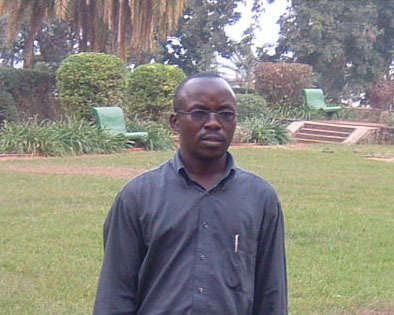 I've been to Bweyeye to prepare the Agricultural season 2012. We have been able to harvest an area of 1ha of corn. Thanks to the support of 'Vleugels van Hoop' we can hope on a successful realisation of both projects. Related to the pig project we can report an increase of 32 piglets. Related to the agricultural project we can fulfil the food request of the beneficiaries. The problem of the food for the pig is resolved.